« How should a news curation team work? @stevebuttry Where were you 4 years ago today? Just heard the anniversary mentioned on Iowa Public Radio News and thought of you. I’m not sure whether I’m amazed that it’s already been four years or that it’s only been four years. But it doesn’t seem like four years ago. I was never prouder of my colleagues than I was that day and the days that followed. I never worked for a news organization that served its community better under more extreme circumstances. It’s kind of startling to look back at the key players who contributed to that day’s coverage and realize how many of them have left the Gazette, either by their choosing or because the company has cut staff (I should acknowledge that when we cut staff on my watch, I had to decide who was cut in the newsroom). I know I’ll leave out some names here, but the Gazette has lost a lot of journalists who excelled in coverage of the flood: Dan Geiser, Mary Sharp, Paul Jensen, Lyle Muller, Rae Riebe, Jamie Kelly, Adam Belz, Jonathan Woods, Michael Barnes, Scott Wingert, and too many more. I treasure the memory of working with them and hope they’re doing well. Publisher Dave Storey led a companywide effort to serve the community that was amazing and inspiring. He’s gone, too, now working in Dubuque. I never saw better leadership than he showed in that disaster. A disaster taxes the full team of a news organization. Circulation had to figure out which subscribers were still in their homes and which roads were still open. Our facilities staff had to sandbag drains and pump water out of our basement (we were on the edge of the flood). They had to find a backup generator to supply us with power for 30 days until utilities were restored. They had to find portable toilets because the city’s sewage system was swamped. Production had to print our paper and the Waterloo Courier with a diminished crew because some workers had lost their homes. And on and on. I was in awe of my new colleagues and their ability to get the job done. Since the anniversary falls a day after the New Orleans Times-Picayune staff was slashed in half, I’ll say again that the support from our colleagues in New Orleans was truly uplifting. I’m sure thinking of them in this difficult time. I was especially sad to see that Dan Shea, the managing editor whose email from New Orleans lifted our spirits, was one of yesterday’s casualties. The flood hit on my third day as editor. I would not have believed that I wouldn’t still be there four years later, let alone that I’d be on my third job in the past four years. Life throws you lots of things you don’t expect, which is perhaps the point of the last bullet. Sometimes it just throws you more than you expect. Cedar Rapids did expect the flood. Towns upstream were flooding and the city was sandbagging like crazy. But the rain kept coming and exceeded all expectations. I saved the Wednesday night email with the forecast of a flood crest at 24-point-something feet, which would have been disastrous. The flood crested Friday, June 13, at something like 31 or 32 feet. The water devastated whole neighborhoods as well as the downtown business district. I hope the remaining staff members are doing well. They still have important work to do. I hope the community is recovering and rebuilding better than it was when I left. I may have something more thoughtful to say for the five-year anniversary. But thanks to Chuck for prompting me to remember a day I can never forget. Even if the anniversary almost slipped past. I joined The Gazette in 2010 at the two-year anniversary and it feels like a lot of the reconstruction work is starting to come to a peak, at least for the downtown area. There are now actually people downtown after 5 thanks to some new nightlife spots that opened up, and there’s a major building project on every block (Rick Smith wrote about that just last weekend: http://thegazette.com/2012/06/10/post-flood-cedar-rapids-taking-shape-with-numerous-projects/ ). I’m kind of sad I’ll be leaving The Gazette later this summer. I’ve seen a lot of the work being done to rebuild, but I’m going to miss the final product. Terrific reflection on that “epic” time in Cedar Rapids. 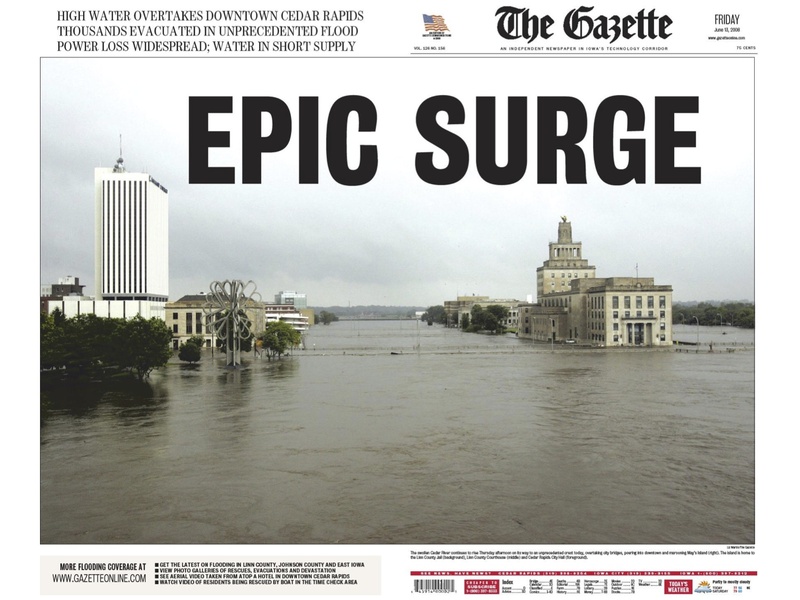 Interesting how that record flood in Cedar Rapids came at the same time as epic changes in journalism — and it was like you were riding “breakers” in both! A team needs bold, visionary leadership, Steve, and that is exactly what you provided during that time. You stressed teamwork across the board (even in the brainstorming that resulted in the “Epic Surge” headline), and made everyone feel part of the team. You offered insightful coaching. We didn’t know you; you didn’t know us. But you helped us bring out the best in The Gazette and the best in us as individuals. Thank you for those kind words, Rae. You were a critical part of that success, and it was a delight to work with you. I remember being deeply impressed with the Gazette’s work during the flood. Three years later, we used many of the lessons learned from Cedar Rapids in covering our own flood here in Sioux City, including “borrowing” generously from your “Epic Flood” A1. It is indeed hard to believe that was four years ago. I’ll never forget the feeling in my stomach those first few days of the flood. But the work so many people at The Gazette did then and in the weeks and months that followed … no adjective does it justice, though “extraordinary” is a good start. Good post, Steve. You were a key part of that extraordinary staff effort, Mike. From the first night to the “Boulevard of Broken Dreams” story to your writing for the Epic Surge book, your graceful writing and your passion for and understanding of your community were a huge and memorable contribution.